There is currently no single book that covers the mathematics, circuits, and electromagnetics backgrounds needed for the study of electromagnetic compatibility (EMC). This book aims to redress the balance by focusing on EMC and providing the background in all three disciplines. This background is necessary for many EMC practitioners who have been out of study for some time and who are attempting to follow and confidently utilize more advanced EMC texts. The book is split into three parts: Part 1 is the refresher course in the underlying mathematics; Part 2 is the foundational chapters in electrical circuit theory; Part 3 is the heart of the book: electric and magnetic fields, waves, transmission lines and antennas. Each part of the book provides an independent area of study, yet each is the logical step to the next area, providing a comprehensive course through each topic. Practical EMC applications at the end of each chapter illustrate the applicability of the chapter topics. The Appendix reviews the fundamentals of EMC testing and measurements. Bogdan Adamczyk is Professor of Engineering and the founder and director of the EMC Center at Grand Valley State University, Grand Rapids, USA. He is also the founder and principal educator of EMC Educational Services LLC, which specializes in EMC courses for industry. Professor Adamczyk's area of expertise is EMC education and EMC pre-compliance testing. He is an iNARTE-certified EMC Master Design Engineer, a founding member and the chair of the IEEE EMC Chapter of West Michigan, and a member of the IEEE EMC Society Education Committee. He was a 2016 IEEE EMC Symposium Global University and Fundamentals of EMC instructor. 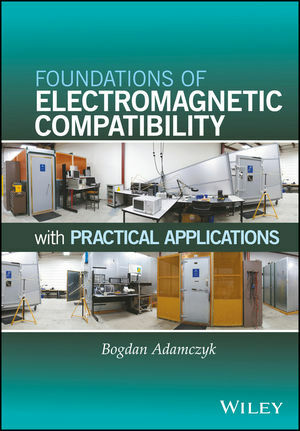 This book has evolved from his participation at several IEEE EMC Symposia, EMC pre-compliance testing at the EMC Center, and his teaching of the Foundations of Electromagnetic Compatibility certificate courses for industry.